Pull manufacturing refers to a production system based on actual customer demand, where information flows “backwards” from market to management compared to that in traditional “push” system. This system controls production from the end of the process, encouraging to produce only what the customer demands. Traditionally, manufacturing industries plan their production based on projections of what the customer wants and needs. This system, called a “push system”, generates overproduction and excess inventory, and because it is not based on actual demand, there’s a probability that products may never be purchased by the customer. To eliminate these forms of waste and encourage an efficient use of resources, the pull manufacturing system started to be applied in many industries as a Lean Manufacturing strategy. The pull manufacturing system is based on the principle that any activity should be performed only when it’s needed further down a production line and ultimately by an external customer. Each step of a process has a set amount of inventory (the necessary to continue production or to meet current demand) and only more will be produced or moved when some of the inventory has been consumed. In this system, the production or movement is usually triggered by a Kanban, which signals production by telling an upstream process what to produce and when. Reduces waste by eliminating overproduction. Reduces the cost of storing excess inventory. Increases customer satisfaction as products are manufactured specifically to fulfill their needs. Quality issues are easier to detect because products are made in small quantities. If a quality issue arises, less defective products would be lost. Decreases the production of products that may never be sold. Reduces total costs and increases profit. Every organization needs to increase its competitiveness in their market in order to thrive and sustain itself in the future. 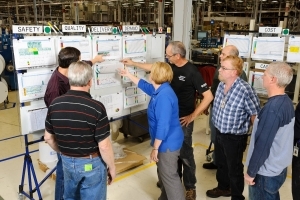 As a Lean Manufacturing tool, pull manufacturing helps organizations identify and target the two most costly forms of waste: overproduction and inventory. By using and producing only what is needed to satisfy its customers, will an organization become more efficient and effective. All of this ensures that every product made and every material used will be an investment of time and money.